We are making your ATM experience faster, easier and more convenient. 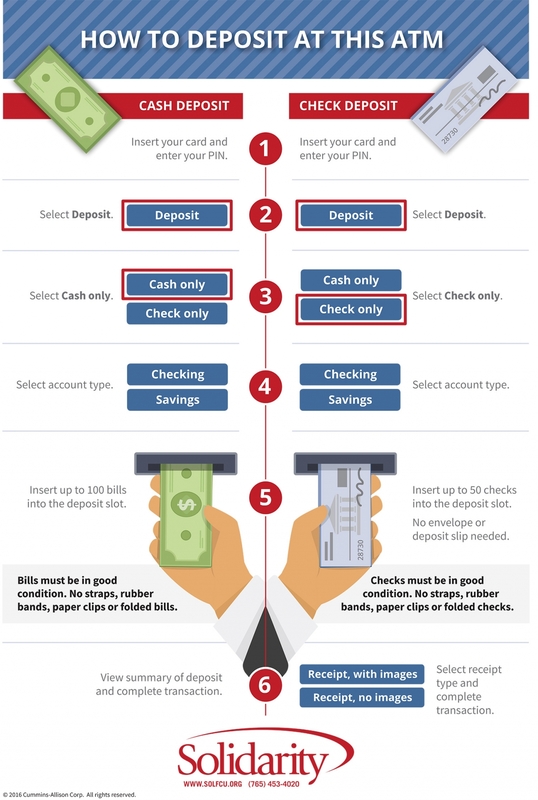 How does the ATM with automated deposit work? Automated deposit ATMs accept cash and check deposits differently than traditional ATMs. Instead of using an envelope and entering the deposit amount on the keypad, you insert cash or checks into a slot on the machine. The ATM counts the items and totals the the deposit, providing an image of each check or a list of bills deposited. Can I deposit my checks and cash at the same time? No. You must conduct two separate transactions. Choose 'check deposit' to deposit checks then 'cash deposit' to deposit cash. Is there a limit to the number of cash and checks I can deposit? Up to 100 bills are accepted for each cash deposit transaction. Up to 50 checks are accepted for each check deposit transaction. If you are depositing more than 100 bills or 50 checks, complete the first transaction and start a new transaction for the additional bills or checks. How soon will the money reach my account? Cash deposits are available for use immediately. Check deposit funds are available as governed by bank/credit union policy or your account agreement. Always separate checks from currency before making your deposit. Never insert checks and currency together. Improper insertion of currency and checks can cause a delay in deposit credit. All bills must be in good condition. Do NOT insert bills with currency bands, currency straps, rubber bands or paper clips. Bring mutilated or taped bills to a branch for deposit with a teller. Currency that cannot be processed will be returned to you, please remove when alerted. Checks must be in good condition. Remove ALL staples, rubber bands and paper clips and stubs. Open all folded checks. Do NOT insert mutilated or taped checks or checks with perforations. Bring these to a branch for deposit with a teller.